Oh Monday. I needed a day like you today. I had the day off today (woo hoo! ), which is exactly what I needed after my week away for work and Saturday School and JB's Sectional game. After Saturday School I came home and literally took a 4.5 hour nap. It felt soooo good! I did not sleep well while away for work - I missed the hubby and pup too much! - and after traveling I really started to feel myself coming down with something. I tend to sleep a lot when I am sick or on my way to being sick. Anyone else get that? After my nap we were off to JB's Sectional Championship! John's little brother is a senior and so now that he is in the playoffs we are anxious and on our seats for each game! They were playing a really good team (number 2 in the state, in their class), so we went into it with fingers and toes crossed. It paid off because they won!! 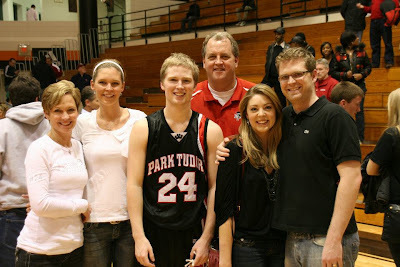 Park Tudor is off to Regionals next weekend, and John and I will be there cheering them on the whole time! Family shot after the game! Leslie, Lauren, JB, John, me and my John! Fast forward to Monday, and I have the day off! After John texts me to tell me he wiped out in our parking lot due to black ice, I turned my alarm off and decided to sleep in. Who needs productive mornings on a day off? John managed to get his work done early in the afternoon, so he came home and we headed out to run errands. First stop: Trader Joe's! Man I missed having fresh produce in the fridge. I was so happy to stock up on veggies, including broccoli, cauliflower, green beans, bell peppers, carrots and potaotes. Our fridge is stocked! *leftovers and fresh 7-grain bread, plus pesto tortellini for a casserole this week! We also hit up Marsh so that I could stock up on my favorite Chobani Greek yogurt. After tweeting the company about how bummed I was about not realizing I was all out, I received some coupons in the mail to help me restock. How awesome is that?! Note all that butter...I stocked up when getting things to make cookies! In addition to the yummy Chobani I did grab an Oikos Key Lime Pie Greek Yogurt which is awesome! I came home and made one of John's favorite dinners - Lemon Garlic Roast Chicken - plus a Golden Vanilla Butter Cake for the assistants in John's clinic. Did you know it's national National Dental Assistant Appreciate Week?? Me neither! But John asked me to bake a cake to show them how much he appreciates all their help. I happily obliged because I know how much they help him each day. John starting eating the chicken breast with his hand - he said it was too good to take the extra time to cut it, ha! Welp, I'm off to finish the Bachelor Women Tell All episode. I don't care how much Courtney cries, I will not stop thinking she is a you-know-what. That and I don't believe she is genuine at all. Even John is here mouthing off with me. (Yes, this is a weakness I have. I'm working on it.) Hope you all had wonderful Mondays! I know - LOVE it! But, I agree, it's never as good as livetweeting (or regular tweeting, talking, etc.) The Bachelor with you! Next week - AHH! Your feed will be blowing up, haha!